Crestview’s Isaiah LaTurner tackles Fort Loramie’s Collin Moore during Saturday night’s Division VII, Region 28 final at Spartan Stadium. 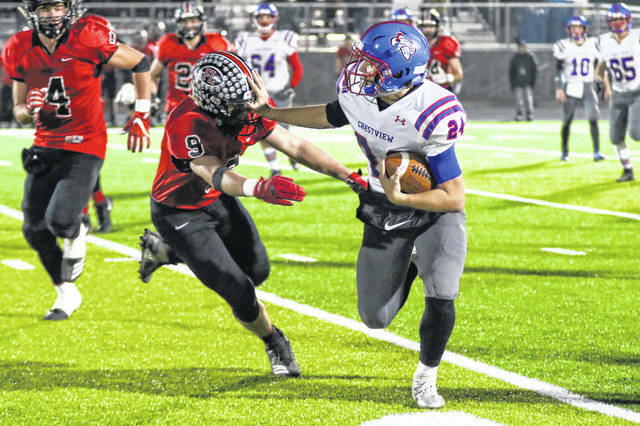 Crestview’s Derick Dealey applies a still arm to prevent Fort Loramie’s Jake Ratertmann from making a tackle during Saturday night’s Division VII, Region 28 final at Spartan Stadium. 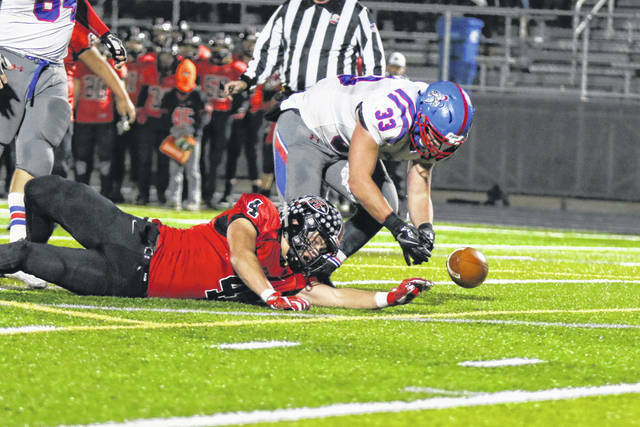 Fort Loramie’s Nick Brandewie and Crestview’s Brody Brecht try to recover a fumble during Saturday night’s Division VII, Region 28 final at Spartan Stadium. LIMA — Fort Loramie was in search of a second-half spark. It got it immediately from Carter Mescher, when he returned the second-half kickoff for an 82-yard TD. Mescher’s kickoff return for a TD helped jump start Fort Loramie to a 48-20 victory over Crestview in the Division VII, Region 28 football championship game Saturday at Spartan Stadium. “I was thinking since we missed that field goal (at the end of the first half), coach tells us to win the next play,” Mescher said. “I was thinking I had to help my teammates to get some momentum. Fort Loramie (12-1) advances to the state semifinals against McComb at 7 p.m. Saturday at a site to be named. It will be the first football state semifinal appearance for Fort Loramie. Crestview ends its season 11-2. The game was scoreless after the first quarter, then it was tied at 14 at the half. Mescher’s kick return for a score gave Fort Loramie a 21-14 lead to start the second half. After a Fort Loramie hold, the Redskins went 58 yards in six plays for a score. Fort Loramie quarterback Collin Moore ran it over from 21 yards for a TD and it was 28-14 with 7:17 left in the third quarter. Moore then got loose for a 54-yard TD and the Fort Loramie lead expanded to 34-14 with 5:22 left in the third. Moore ended up with 17 carries for 133 yards. He had TD runs of 7, 21, 54 and 3 yards. Moore only ran for 23 yards in the first half. Mescher had three carries for 83 yards with a 60-yard TD. Crestview’s Drew Kline had 16 carries for 147 yards. He had a 22-yard TD. In the air, Kline completed 11 of 26 for 116 yards and one TD. The Knights also had four turnovers, two on fumbles and two on interceptions. Three of those turnovers came deep in the Crestview territory and led to TDs. “Turnovers were killer. No doubt about it,” Crestview coach Jared Owens said. The Knights spend the bulk of the first quarter feeding tank-like running back Brody Brecht up the gut. 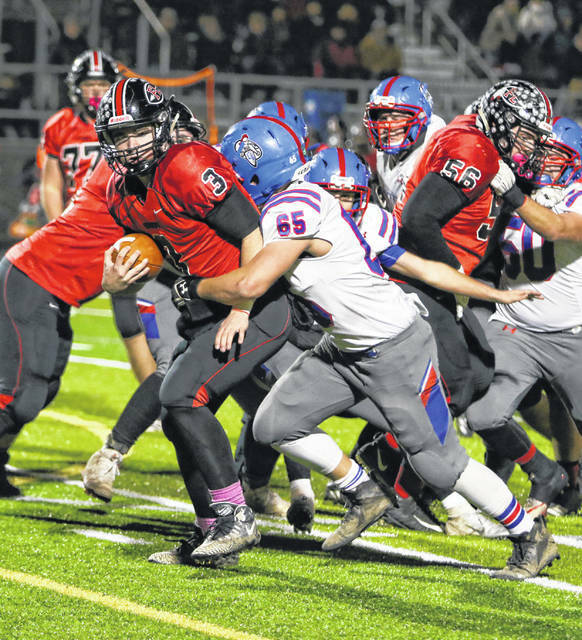 Crestview drove deep into Fort Loramie territory three times, but came up with nothing after being turned away at the 23, 19 and the 9-yard line. The Knights scored first after getting the ball on the Fort Loramie 28. Crestview went three plays over the 28 yards for the score. All that feeding Brecht up the gut, set up Kline around the end. Kline turned the right corner for a 22-yard TD run. With the two-point conversion, Crestview led 8-0 with 6:55 left in the second quarter. On Fort Loramie’s second play on the next drive, Mescher took the ball on the jet sweep and went around the right side for a 60-yard TD run. That cut the Crestview lead to 8-7 with 5:50 left in the first half. Crestview then lost a fumble on a muffed snap and Fort Loramie’s C.J. Billing recovered at the Crestview 13. Three plays later, Fort Loramie scored on quarterback Collin Moore’s 7-yard TD run. That pushed the Redskins ahead 14-8 with 3:29 left before halftime. Kline was in full keeper mode and went off right tackle for an 80-yard run, to the Fort Loramie 10. Then, on fourth-and-goal from the Redkins’ 3, Derick Dealey took the pitch and sprinted to the left corner before diving over the pylon for a 3-yard TD. That tied the game at 14 with 55 seconds left before the half. By the half, Kline had 118 yards rushing. This entry was tagged crestview. Bookmark the permalink.